California is embarking on a program of capturing storm water from flood control channels for urban landscaping at high costs. And stormwater capture projects won’t require voter approval under Proposition 218, the Right to Vote on Taxes Act, because courts have ruled stormwater recapture is not a tax on top of basic water service. Prior to 2014, there was no taxing authority and no legal way for county flood control agencies in California to capture urban stormwater and reuse it for irrigating landscaping along highways, public parks, public golf courses, greenbelts, wetlands and cemeteries. Recent legislation changed that. Assembly Bill 2403, by Assemblyman Anthony Rendon, D-Lakewood, authorized urban flood-control districts to morph into landscaping water districts. A recent appeals court decision in the case of Griffith v. Pajaro Valley Water Management Agency also redefined sewer stormwater as non-potable water that could be re-used for urban landscaping. And the proposed $7 billion water bond, Proposition 1 on the November ballot, provides $200 million in funding for stormwater capture projects on a matching-fund basis. But is cost no object at all in finding new sources of water that in the past were considered uneconomic to develop? And where will flood-control districts be able to find enough land along their concrete-lined urban flood control channels to build storm water capture basins and pumping plants? Even if land were available or could be condemned by eminent domain, the cost of acquiring such land would be enormous. And use of eminent domain would be unpopular. 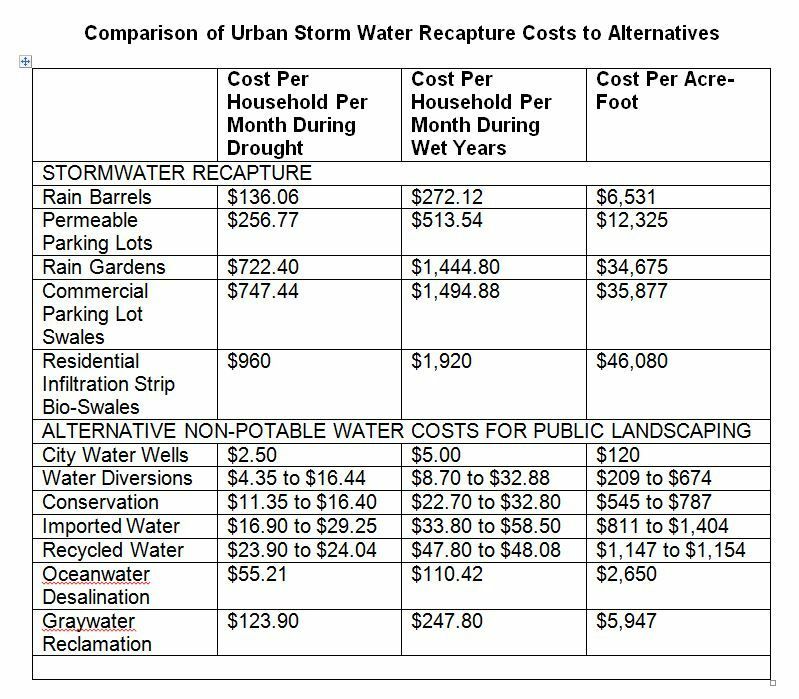 With those points in mind, let’s look at the comparative costs to develop stormwater for urban landscaping uses. A 1995 Florida study estimated the cost to capture raw, non-potable storm water was $23,400 per acre-foot. An acre-foot of water serves about two households in a wet year and four in a dry year in California. 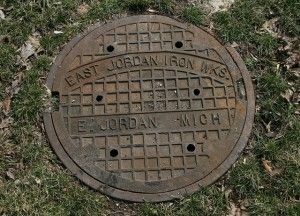 This would equate to a water bill of between $487 to $975 per household per month. $960 during drought for residential infiltration strip/bio-swales ($46,080 per acre-foot). It should be emphasized that the above costs are for raw, untreated water (non-potable water), not drinking water, which would cost much more. Graywater (filtering of relatively cleaner waste water from baths, sinks and washing machines, but not toilets): $123.90 per household per month during drought ($5,947 per acre-foot). Even expensive oceanwater desalination at $55.21 per household per month during drought would be 59 percent lower than the cheapest stormwater reclaiming technology of rain barrels at $136.06 per household per month during drought. It also should be noted that the costs per household per month shown above are double during wet years, when there is no conservation. Reclaiming stormwater for watering public landscapes (freeways, public parks, etc.) is a very pricey alternative that arguably should have been put to a vote of the electorate in each county flood-control district. Unfortunately, with the help of the courts and both political parties in California that voted for AB2403, the rights of voters to check government bureaucratic expansion during the crisis of a drought has been usurped. As CalWatchdog.com has detailed, water subsidies by taxpayers for California farmers never existed and crop subsidies are ancient history with the globalization of agricultural markets. Bottom line: funding for stormwater reclamation projects in Proposition 1 on the November 4 ballot will just contribute to economic waste.